Using data from the NuSTAR X-ray satellite, a team of astronomers has found that the emission from quasar 3C 273 most likely arises from two components: an accretion disk around the black hole and very rapidly moving charged particles in a jet. 3C 273 is the nearest high-luminosity quasar to Earth, about two billion light-years away, and shining with the power of more than about three thousand Milky Way galaxies. Since its discovery in 1963 it has been extensively studied at many wavelengths. It is bright and very variable from the radio wavelengths to the X-ray and gamma-rays, and has rapidly moving jets of charged particles. One of the major theoretical challenges for 3C 273 has been explaining the origins of the various kinds of dramatic activities seen. Two generic suggestions have been proposed based on optical variability: emission from an accretion disk around the black hole nucleus, and/or emission from fast-moving charged particles (but unrelated to the radio jet). One of the interesting complications is that the X-rays can be produced not only by very hot gas but also by high velocity particles which add some of their own energy to radiation that they scatter, for example converting radio emission into X-rays. Sorting out the possibilities has been a priority for scientists studying quasars. 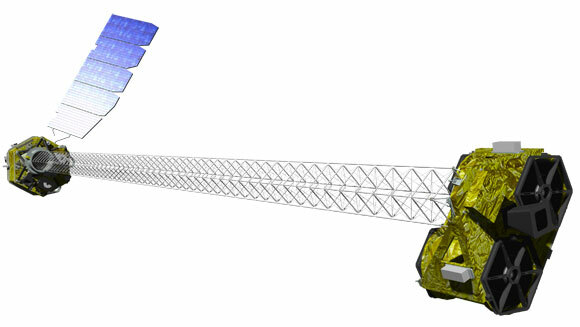 The NuSTAR mission (Nuclear Spectroscopic Telescope Array) is a space-based X-ray telescope that can detect X-rays with wavelengths smaller (energies higher) than those detectable by the Chandra X-ray Observatory by about a factor of eight. Launched in 2012, NuSTAR is the first space-based direct-imaging X-ray telescope to be able to observe these energies. CfA astronomer Laura Brenneman joined a team of colleagues to study 3C 273 with NuSTAR, combing the results with observations from other space-based X-ray and gamma-ray missions. In 2012 while undertaking a coordinated observing campaign, the team found that the emission was in a relatively weak phase which enabled them to diagnose X-ray emission signatures that are normally overwhelmed by other emission. The scientists conclude that the two-component model is very likely correct, with some emission coming from the accretion disk and higher-energy light coming from a beamed jet of charged particles. With additional, multi-observatory observations of the source, the team hopes to refine their description with more explicit values for the physical conditions present. Be the first to comment on "NuSTAR Reveals the Active Galactic Nucleus of a Quasar"